On Friday, the RNC sent out an email calling for supporters to sign a petition in support of Congressman Paul Ryan’s budget proposal. Quick, huh? 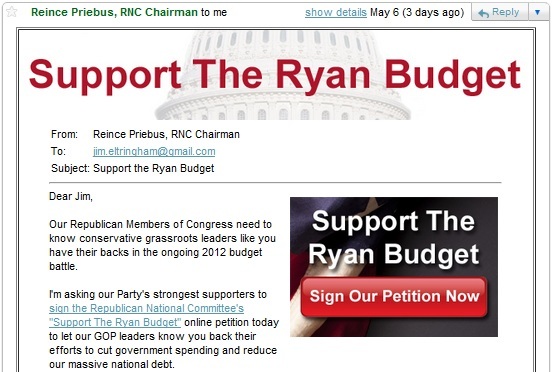 Speed kills, and this RNC email came over a month after Ryan uploaded his YouTube video outlining the problem with continuing government spending. That gave the Democrats a month to complain that the GOP budget proposal would strip old people of their medicine like a starving robot. The RNC is a little bit late to the party on this one. On the plus side, the email does direct activists back to a petition, where they can register their support and send their own brief message. If the RNC is doing things right, that means the folks on the email list who respond to this email will be tracked and identified for the upcoming Presidential races. If those people live in some place like Ohio, they should be on the extra-special, “we need these people to go to the polls and I bet they’d drag four people” list. The spending issue isn’t going away, and there’s plenty of time to re-frame the debate. For the RNC it’s better late than never.